I'm not looking to read anything extra special into what we see, just recognise the 'if you build it, they will come' scenario. 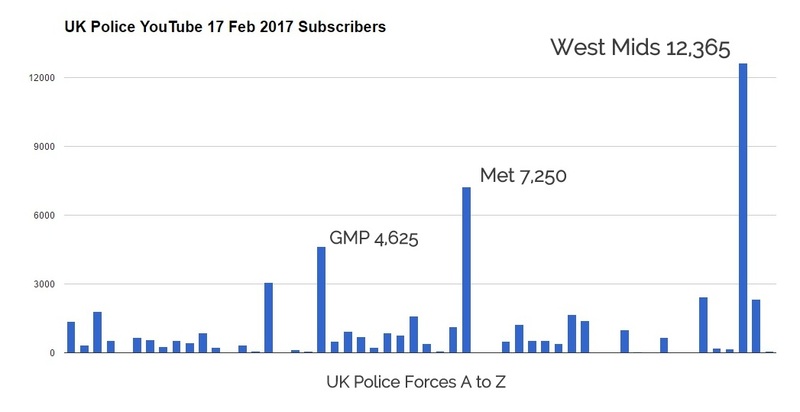 West Midlands Police top the list, with over 10,000 subscribers they qualify to use the YouTube Mobile Live Streaming App. Mind you anyone can stream live video to youtube, just use a 3rd party app, my go to is Live on YouTube from Emoze (android or iOS. For iOS search app store). 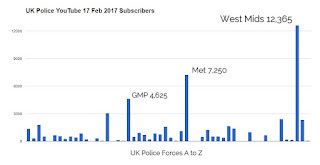 With 13.1 million views for WMP, which of course stand out above the rest, this is not all the story. For Norfolk and Suffolk Police have closed their YouTube accounts favouring Vimeo instead (Norfolk Police and Suffolk Police on Vimeo). I had a fast reply on twitter from Norfolk Police which gave this reason, 'We had concerns over recommended videos that were provided at the end of our content, hence the transition' 20 Feb 17. On my last visit, one video about road safety and the David Holmes story had over 10 million views for just that one video. You can still watch and read at this page. You can therefore see, had Norfolk stayed open at YouTube, then the chart would look a little different. But we take this as is and respect each force's individual choice. Video is everywhere - and it certainly is, you can upload video to YouTube, Facebook, Twitter, Periscope, Instagram, Vimeo, Snapchat - pretty much anywhere on the internet these days. Live video is easy to stream on YouTube, Periscope/Twitter, Facebook and now Instagram. And that's not forgetting legacy platforms like Livestream, Ustream and Bambuser. As a footnote, YouTube launched tv.youtube.com ast night too (blog post if you are interested). As a conclusion and further thoughts - the power in any video is in the story telling and the timing. Get that right and you have something that the audience will stick around for. I watched this video just yesterday and it's so impactful, website link: itswhatwedo.org.uk.